Each year, the team at StaxUP Storage helps local schools in Southern California collect supplies for their students. This year 20 schools will be participating, and each one will be paired with one of our storage facilities. 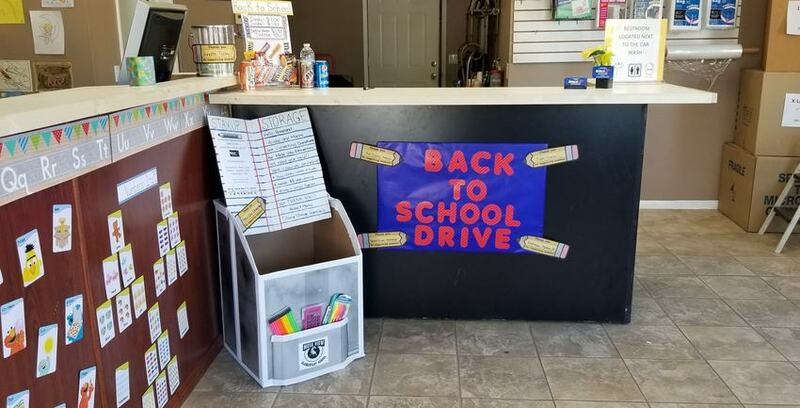 While the drive is officially running from June 1st to August 1st, many of our facilities have already begun collecting for their assigned schools. The StaxUP Storage Team is geared up and going full-steam on the 2018 StaxUP Storage Back to School Drive! Korina Sandoval, assistant manager at StaxUP Storage in San Ysidro and Tiane Moore, assistant manager at StaxUP Storage in San Marcos are coordinating the company-wide event. Many team members have created displays to further draw attention to our annual Back to School Drive. Korina gave us some insight into why the schools in the area were chosen to be a part of the drive, “We are very close to the border, so a lot of the kids that go to that school come from Mexico. Yesenia Wilhoite, Manager at StaxUP Storage on Hill Street in El Cajon, says her facility is raising money for Oak Tree Academy. The team at Ballpark Self Storage took their own unique angle on building their donation box. Korina says it is very important for her and the StaxUP team to reach out the the community, especially to those in need, “It’s always rewarding to be able to help someone. Especially when they are not able to get the supplies on their own. It’s true: most tenants at San Ysidro are very willing to donate. However, selling soda and candy helps sweeten the deal for some customers. Its hard to ignore this display for the Back to School Drive at StaxUP Storage in San Ysidro. We know that with the help of our coordinators Korina and Tiane, generous donations of time, money, and supplies from the community as well as the facilities, this will be the best year yet for the annual school supply drive!